The Berger Picard Club of America would like to thank the Greenwich Kennel Club for allowing us the privilege for holding our Open Show in conjunction with their show. The turn out for our Miscellaneous and Foundation Stock Breeds was excellent with 34 dogs entered! Judge Frederick Vogel did a fantastic job helping our novice exhibitors feel welcome to the AKC ring. The Meet the Breeds and FSS parade of breeds were both a hit! The Greenwich Kennel Club is offering a Meet the Breeds and Parade of FSS breeds during their show. 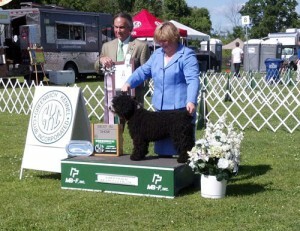 Last year there was a terrific turnout of 18 Miscellaneous breeds entered. We expect a great turnout!! This entry was posted in Uncategorized on May 15, 2014 by Betsy Richards.